Lately I’m obsessed with pesto. It makes everything taste so delicious! I’ve made pesto risotto and pesto chicken and now pesto pasta. My favorite place to buy pesto is at Costco. It comes in a jar that costs around $7-$8, which is a good price considering less than half that amount would cost $5 at a normal grocery store. This recipe starts with your favorite pasta. 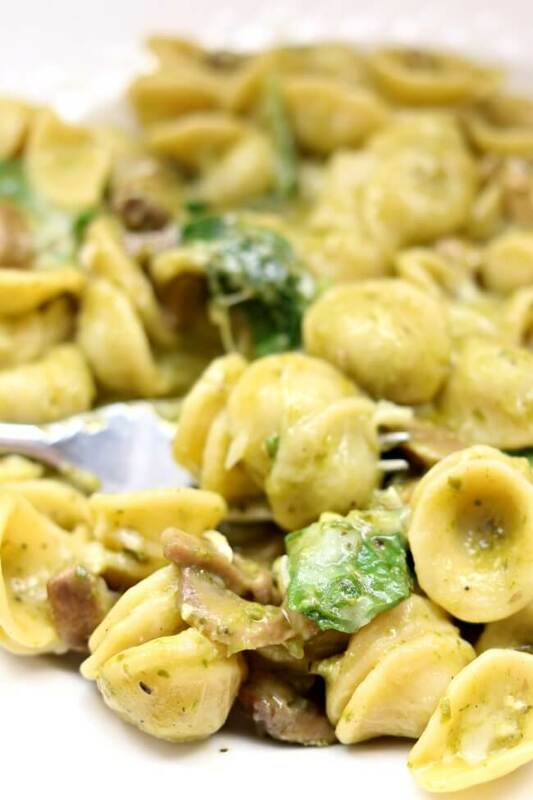 I decided to use orecchiette pasta this time around. You could easily use spaghetti, bowties, rigatoni, penne or whatever you like best and is hanging out in your pantry. I made 8 ounces of pasta which is enough for about 4 people, however this recipe can easily be doubled. Typically a box or container of pasta is 16 ounces. Just double all the ingredients listed below and keep the cooking time the same. I decided to use the mushrooms that I had in my refrigerator…just plain white button mushrooms. If you want you can use a fancier type of mushrooms but secretly white button mushrooms are my favorite. To add more flavor to this dish I went ahead and sautéed the mushrooms in a little oil before adding in the rest of the ingredients. It’s an extra step, but I think it’s worth it. I had fresh baby spinach so that’s what I used. If you have frozen spinach I believe that could work as well. Just run hot water over it and squeeze out the excess moisture. When everything is tossed together it tastes so amazing and is a perfect dinner for any night of the week. If your family is appalled by the thought of a meatless meal then you can add in either cooked or uncooked chunks of chicken breast in with everything else at the beginning. It will cook at the same rate as the pasta as long as it is cut up into bite size pieces. To make Instant Pot Spinach Mushroom Pesto Pasta I used my 6 quart Instant Pot Duo 60 7 in 1*. I love this Instant Pot because it has the yogurt making function which I use almost weekly. It has two pressure settings (high and low), and there are also little slots in the handles so that you can rest the lid there instead of putting it down on your counter-top. 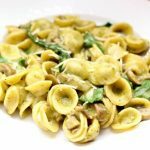 An easy, tasty and fast meatless meal of your favorite type of pasta enveloped in a basil pesto sauce with plenty of sauteed mushrooms and spinach. Add bites of chicken if you prefer. Turn your Instant Pot to the saute function. While it heats up, chop up your mushrooms. When the display reads HOT add in your oil. Then add in your mushrooms, salt and pepper and saute for about 5 minutes. Add in your pasta and water. Cover and secure the lid into place. Make sure valve is set to sealing. Set the manual/pressure cook button to 5 minutes (if cooking with another type of pasta read my note below). When the time is up move the valve to venting. Remove the lid. Stir in the spinach. And then stir in the pesto and cheese. If there is too much liquid you can use a cornstarch slurry to thicken the sauce by mixing 1 Tbsp of cornstarch with 1 Tbsp of water and then stirring the mixture into the pot. 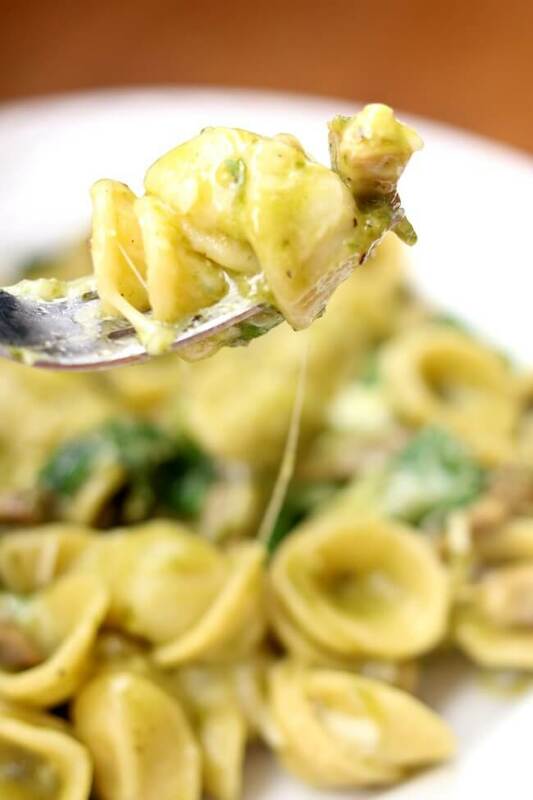 Scoop the pasta into serving dishes and enjoy! Store leftovers in an airtight container in the refrigerator for up to a week. This recipe can easily be doubled for a larger group of people. Double all the ingredients and keep the time the same. To determine how long to cook your choice of pasta look at the back of the box. If the recipe reads boil for 12 minutes you will divide that number by 2 and subtract 1. So for 12 minutes on the stove it would be 5 minutes in the Instant Pot. 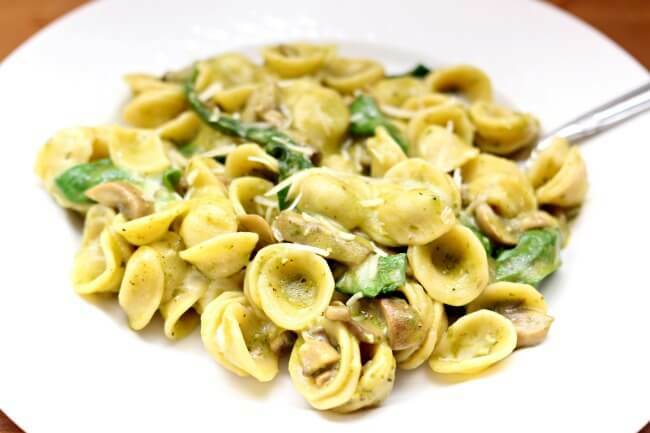 Thin spaghetti will take less time and more hearty noodles like these orecchiette will take longer. If you’d like to add chicken to this recipe, you can. You can add in either cooked or uncooked chunks of chicken breast in with everything else at the beginning. It will cook at the same rate as the pasta as long as it is cut up into bite size pieces. Can you use stuffed ravioli in this recipe? Yes, I would just use a 1 minute pressure cooking time though. I made this with chicken thighs as I needed the protein to make it a main dish for my family. I did use the pasta you called for but after only 5 min and a quick release as you requested in your recipe, the pasta wasn’t done. The flavors were there but too much water after the cooking. I threw the water out then added the pesto sauce, cheese, and spinach. I also used provolone instead of mozzarella because that’s what I had. Should I add a minute on the cooking time when I make it next time so the pasta is cooked? What do you think? It’s definitely a keeper and thanks for the recipe. Yes I would try adding an additional minute next time. That will probably help! You had me at pesto with this one. I can’t wait to try it! I am although trying to stay away from pasta as often as possible. Can you use quinoa instead? Hi Denise, I bet that would taste so great. I love quinoa. I would use 2 cups of water and 1 1/3 cups of rinsed quinoa. 1 minute cooking time with 10 minute npr. Let me know how you like it! This was so easy and delicious! I added some chicken too. Cooked beautifully. Can you please tell me the nutritional values for this meal? I will use whole wheat pasta if I make it. Hi Stephen, I just added the nutritional values to the recipe card. If you use whole wheat pasta it will have about 10 less calories per serving. I hope you like it! Do you have a recipe just for cooking pasta (different kinds) in the Instant Pot? It really would be so helpful. No I don’t! But I really need to make a post like this. Thanks for the suggestion.